100% Cashmere. Fabric weight 220 g/m². Yarn count Nm 16. 130 x 190 cm, including the 7 cm long fringes. Weight 550 g approx. It's not for nothing that the noble cashmere is considered the most precious of natural staple fibres since it is very fine for a natural fibre, very soft and warm and surprising light. 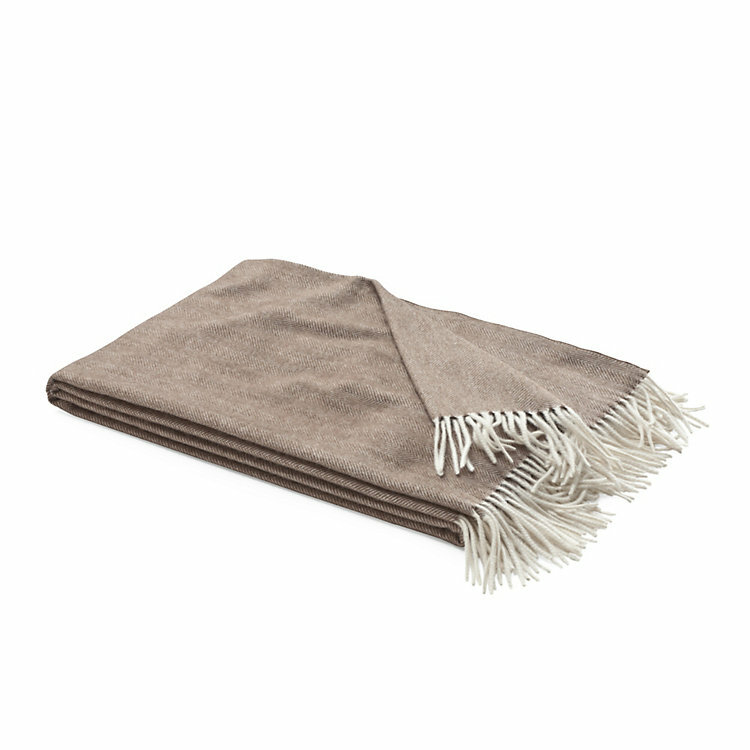 We use the best unbleached and undyed cashmere for our blankets. The selected raw material comes from China and Mongolia, while the darker shades come from Iran and Afghanistan. The fibre length is between 32 and 34 mm, and fibre fineness is 16.5 micrometres. The percentage of the coat used is only around 0.2 to 0.3%. The cashmere yarn is spun in Biella, Italy. The German weaving company Hohenberger weaves this blanket from the extraordinary durable and fine yarn in the classic herringbone pattern: They use white cashmere in the warp and shades of brown in the weft, which is why all three blankets shown here have white fringes. The cashmere remains unbleached, and undyed und undergoes no chemical processes but has merely been mechanically processed. After washing and kneading, the blankets are dried and lightly roughened with a dried thistle. Hand wash at up to 30 °C using mild detergent (or a mild hair shampoo). Dry flat. Our cashmere blankets require gentle treatment: do not rub, pull or wring out, and do not leave wet without spreading out.